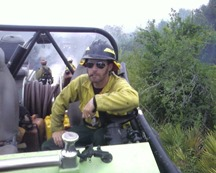 IAM Local 376 member Bob Blasi cutting down timber while working on a forest wildfire. Bill Blasi and Ron Pevny have never met, but both men have something admirable in common. They have spent their careers risking their lives fighting wildfires across the United States and they both serve as union stewards for NFFE-IAM. Blasi grew up a self-proclaimed “city boy” in Boston, but when he made his first trip to the Northwest and saw the mountains, he knew he wanted to live the outdoor life. He always felt a strong desire to serve his country and firefighting gave him that opportunity. He remembers being away from home for up 60 straight days early in his career as a hotshot crewmember. IAM Local 1781 Steward Ron Pevny has been fighting fires for 16 years and has worked all over the county. Both men have spent countless hundreds of hours alone with a shovel or a Pulaski but stress the importance of coordination and teamwork. When a wildfire breaks out, a fire camp larger than any nearby city might emerge to mobilize and accommodate the needs of 2,000 firefighters or more within 24 hours. When on a fire line, an individual’s capabilities, and limitations, will potentially affect the work and safety of dozens of other men and women fighting the same blaze. They must have confidence in one another. 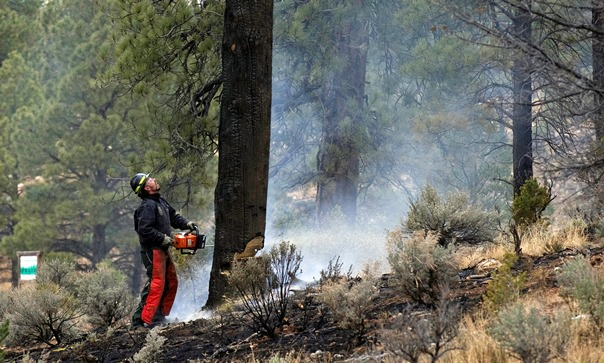 Seasonal federal firefighters work when wildfires are most prevalent, usually from April through October, and must plan for the months without any guaranteed income. At 41, Ron Pevny has been fighting fires for 16 years and has worked all over the country, including on engine, hotshot and helicopter rappelling crews. He’s also spent time patrolling with a swamp buggy in the Florida Everglades. He now works full time as a patrol firefighter and forest protection officer in the Lake Tahoe basin in California and Nevada. As a steward for Local 1781, he also speaks to new hires about the NFFE-IAM contract at regional orientation sessions. At 57, Bob Blasi has put down his shovel and works as a fire prevention specialist for the forest service and continues his union service as a steward for Local 376, near Flagstaff, AZ.